Santikaro and Phra Paisal Visalo have been long time partners in the struggle to reform Thai Buddhism. Both have been deeply influenced by the pioneering efforts of the late Buddhadasa Bhikkhu and Phra Dharmapitok (P. A. Payutto). They are not only concerned to rectify erroneous understandings of core dharma principles, but also working to see that these principles play a guiding role in the development of Thai society. This chapter is an attempt to bring together their written perspectives on the nature and significance of dåna (generosity) and puñña (goodness/merit) into one essay. While the two halves of this chapter were written separately, we hope the reader will find enriching the shared perspectives of these two spiritual friends (kalyåˆamittå). The custom of making merit (puñña)—lay people providing monastics and temples with material requisites—constitutes the core of popular Buddhist worship and practice in Theravada Buddhism. The dåna (generosity) embodied in providing these requisites is the key concept in this practice, which is one of the three main methods of making merit. Dåna, however, has broader meanings and applications. For example, as one of the Ten Perfections (påram¥), it is the simplest yet also the highest practice of perfection for the bodhisattva, and is thus equally suitable to lay and monastic alike. When we understand dåna in this broader and deeper way, it transforms from a ritual act of merit making into an ethical act of doing “good,” the literal meaning of puñña. If we want to understand sangha as authentic community life, rather than in the more narrow terms of the male monastic Sangha, we need to see dåna in such a way—as a reciprocal act of circulating “the gift,” being the glue that bonds lay and monastic, male and female, senior and junior, together. Unfortunately, dåna and puñña have often not been understood in this way. In the period of high economic growth in certain Theravada Buddhist regions over the last thirty years, capitalism has exacerbated the ritualistic nature of dåna and puñña. Especially in Thailand, capitalism has intensified the shift from understanding puñña as goodness to merit by commodifying it in terms of money. In this way, dåna is no longer an act of service but the money to buy such services. The sense of reciprocity—of circulating “the gift”—is being lost, while materialism, individualism, and alienation increase. When wealth rather than character or service to others becomes the basis for being a good Buddhist, various forms of social injustice such as patriarchy and economic discrimination are legitimized. This chapter examines these problems and also considers the potential for authentic dåna and puñña. It concludes by looking briefly at a movement developing in Thailand to restore merit making as the gift of service. Phra Dharmapitok (P. A. Payutto), the leading Thai Buddhist scholar and writer of recent years, concurs that the core principle of the old system was bun, goodness.vii Bun is what circulated within the religious economy of Thai life, back when the divisions between family, economics, community, politics, religion, and personal life were tenuous. Villagers gave what they had to give and considered “good,” worthy of giving: their best food, robe material, betel nut, tools, materials for repairing temple property, labor, and craft skills. The monks gave advice, consolations, blessings, rituals, teachings, meditation instruction, leadership, writing, and other specialized skills. Most important, the participation of monks gave religious meaning to daily acts of decency, generosity, and kindness, elevating these from the realm of mutual obligations to spiritual significance. As noted earlier, Buddhist lay practice has tended toward simplified versions of dharma practice, such as the puññakiriyavatthu, in comparison to the more difficult practices recommended for monastics. Since Brahmanistic and Hindu influences have always been strong in Theravada Buddhist countries, it is not surprising that the common Buddhist understandings of karma, dåna, and puñña have become distorted by such influences. In particular, the lay practice of dåna has often become limited to making ritual offerings to the monks in order to gain merit (puñña) towards a better rebirth. As the monastic centered tradition continued to emphasize that lay followers, especially women, could not attain enlightenment in this lifetime, lay practice continued to devolve into performing or sponsoring rituals towards securing an advantageous rebirth. “Senior monks discouraged sermons on [essential] principles and teachings such as not-self (anattå), dependent origination (pa†icca samuppåda), thusness (tathatå), and voidness (suññatå). Supposedly, these were too difficult for ordinary people to understand. 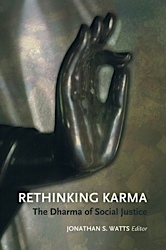 For the masses, moral teachings based on ancient—and not particularly Buddhist—beliefs about karma, rebirth, merit, heaven, and hell were considered appropriate and sufficient” (Santikaro in Buddhadasa 1994, xvi). Here, too, the Jåtakas have played an especially powerful role as myths that influence popular beliefs. For example, the Mahåjanaka Jåtaka (J.vi.35) implies that if one has accumulated enough merit in past lives, one will be spared from misfortune or get lucky in this lifetime, often through the divine intervention of certain gods. However, Phra Dharmapitok (P. A. Payutto) remarks, “Overemphasis on rebirth into heaven realms and hell realms ignores the good which should be aspired to in the present . . . Good actions are performed for the sake of profit. Overemphasis on past and future lives ignores the importance of the qualities of moral rectitude and desire for goodness, which in turn becomes a denial of, or even an insult to, the human potential to practice and develop truth and righteousness for their own sakes” (Payutto 1993, 50). Such limitations and distortions are to be expected in popular religiosity; they are part of the local culture over which ordinary people have some control. Modernity brings in powerful influences that villagers have little influence on. The attitude that helping other people is also a merit making practice—that offering dåna to monks is not the only way to do puñña—can, in fact, be found in traditional Thai culture. There are many traditional practices in the North, as well as other regions, that are based on this attitude. For example, than tod is a practice where requisites or dåna (than) are offered to poor people by laying (tod) them near their houses and then lighting a firecracker to alert the recipients. It is believed that one can obtain as much merit from this practice as offering dåna to monks. Unfortunately, such practices have recently fallen into disuse, whereas offering dåna to monks still prevails, giving the impression that puñña can be obtained only through practice and rituals involving monks. In the past, however, offering dåna to monks and acts of community service were never distinguished. Since the temple was the center of community life, utensils offered to monks, for example, were often borrowed by villagers for feasts on various occasions, e.g. at a wedding, ordination, or funeral. As Thailand has modernized, the focus of village activities has shifted from the temple to secular institutions, such as modern schools and other social services provided by the government. Monks have become marginalized and their roles confined to strictly religious rituals like funerals and of course merit making. In this way, dåna offered to monks has become more and more confined to their personal use in the temples. In other words, puñña involving monks is increasingly divorced from community service. The handbook begins by introducing the reader to the three bases of meritorious action (puññakiriyavatthu) earlier, as well as seven others that are part of the popular tradition: humility (apacåyana), rendering service (veyyåvacca), sharing or giving out merit [i.e., getting others involved in meritorious service] (pattidåna), rejoicing in other’s merit (pattånumodåna), listening to right teachings of the dharma (dhammassavana), teaching the dharma properly (dhammadesanå), and correcting one’s views (di††hujjukamma) [D.A.iii.999]. The handbook also suggests new practices of puñña and dåna that are beneficial to recipients and that contribute to social and spiritual well-being. In 2003, another handbook was published, a smaller and more concise collection of merit making practice with the title 30 Practices of Puñña for the Well-Being of Life and Society. At the back of the booklet, the addresses of non-profit organizations are provided for those who want to do meritorious acts by volunteering or donating money. For those who seek spiritual well being, places to do meditation in various parts of the country are also included. The booklet was put on sale at gas stations in Bangkok one week before the beginning of the vassa. Again, within a few days the booklet became very popular, with much positive coverage in the media. Nine reprints have already been made, totaling two hundred thousands copies. The fact that both handbooks are still in demand reflects the enthusiasm of modern people to know and participate in creative puñña practices that contribute to the well being of both individuals and society. People are showing that they want an alternative to conventional dåna practice that is wasteful, ritualistic, materialistic, and just another form of consumerism. Phra Sekiyadhamma (a national network of socially concerned monks) and the Network for Buddhism and Society have been working to expand the practice of these reinvigorated forms of merit making to the national level. This year the Network for Buddhism and Society wants to take a further step in initiating concrete social action, hoping to persuade Thais to make merit by doing voluntary work during the vassa. Many non-governmental organizations are participating in this project, which has chosen the issue of children as the central theme. Officials in large private companies are the target group of this campaign. Thousands of volunteers will be recruited from the private sector to participate in various projects aimed at improving the quality of life for children in various ways, e.g. education, environment, media, social welfare, and human rights. This campaign not only aims to create a new attitude towards puñña and dåna among the Thai public, but also seeks to create a nationwide voluntary movement based on the concept of puñña. It is designed to revive the concept of puñña as a cultural force for the well being of society as a whole, instead of being limited to temple or religious rituals. Paisal Visalo & O. Chettakul. Bangkok: Komol Kheemthong Foundation. The Connected Discourses of the Buddha: A New Translation of the Sa◊yutta Nikåya. 2000.
i generosity (dåna), virtue (s¥la), renunciation (nekkhamma), discernment (paññå), energy/persistence (viriya), patience/forbearance (khanti), truthfulness (sacca), determination (adhi††håna), good will (mettå), and equanimity (upekkhå). ii In other words, the Four Divine Abidings (brahmavihåra) of friendliness (mettå), compassion (karuˆå), sympathetic joy (muditå), and equanimity (upekkhå). iii Not that he was aware of future awakening (nirvana); this is retrospectively added to the story, as so often happens. iv I take this to be an early example of bodhicitta, so much emphasized in the Mahayana. v Here, “Sangha” refers to the four kinds of noble ones, the exemplars of dharmic life and the leaders of the community of the Buddha’s disciples. vi Kamala Tiyavanich’s The Buddha in the Jungle (Chiang Mai: Silkworm, 2003) provides abundant illustrations of this. vii From a Thai language talk given at Suan Mokkh in the late 1980s. To my knowledge, this was never published. viii Luang Pho Khun has been in poor health in recent years and has fallen from the level of popularity he held when this article was written. Books and articles by Phra Paisal Visalo uploaded in this website with cordially by korobiznet. webmaster 2552 No rights is reserved.